Beach volleyball history and where this great game first started. In 1983, the AVP (Association of Volleyball Professionals) was created. The AVP consists of the best pro beach volleyball players in the U.S.
On May 31, 2001, the AVP was reorganized and led by Leonard Armato along with his company, Management Plus. Armato united the men and women players of professional beach volleyball together into one organization. The new Association of Volleyball Professionals Tour has grown and capitalized on the fact they have one property that could maximize sponsor dollars, marketing opportunities, media coverage, and prize money. 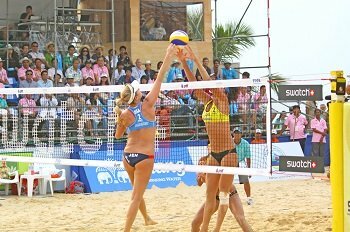 Today, the AVP stands alone as the only pro beach volleyball tour in the country and has a cooperative relationship with USA Volleyball and the Federation International de Volleyball (FIVB). In the 1920s, people start playing volleyball on the beaches of Hawaii. Also, many people say volleyball started in Santa Monica, California where they first started playing 6s on the beach. In the 1930s, the first doubles beach volleyball game is played in Santa Monica, California. Also, in the 1930s beach volleyball appears for the first time in Europe. In 1947, the first official two-man Beach Volleyball tournament is held at Will Rogers State Beach, California. There wasnt any prize money. In 1948, the first prize money was given out at a tournament held in Los Angeles, California. The prize was a case of Pepsi. In the 1950s, the first volleyball tour is organized by Parks & Rec. Five California beaches for the circuit are Santa Barbara, Will Rogers State Beach, Sorrento Beach, Laguna Beach, and San Diego. Also in the 1950s, the first volleyball tournament takes place in Brazil. The tournament is sponsored by a newspaper publishing. The first Manhattan Beach Open in beach volleyball history takes place in 1960. In the 1960s, Open tournaments are held on thirteen beaches in California. In 1970, the first Hermosa Beach tournament is played. Ron Von Hagen and Henry Bergman win the title. In 1975, a tournament is held in San Diego, California. The tournament has 250 fans and $1,500 in total prize money. Dennis Hare and Fred Zeulich win the tournament. In 1976, a beach volleyball tournament is held at Will Rogers State Beach. The tournament has a $5,000 first place prize and about 30,000 spectators. Also in 1976, Ron Von Hagen retires with 62 Open wins. Ron Von Hagen is now considered in beach volleyball history as the Babe Ruth of Beach Volleyball. In 1978, Jose Cuervo Tequila becomes beach volleyballs first major sponsor. In 1979, Manhattan Beach has a King of the Beach Tournament. The prize money totals $11,000. In 1980, the first beach volleyball sponsored tour had $52,000 in prize money. The tour had stops in San Diego, Santa Barbara, Laguna Beach ($5,000), Manhattan Beach ($10,000), The King of the Beach ($12,000), and The World Championships ($15,000). In 1981, another major sponsor joins beach volleyball, the Miller Brewing Company. In 1982, the tour becomes national with $69,000 in total cash prizes awarded for six events. In 1983, $137,000 in total cash prizes is awarded for 12 tournaments. The AVP is formed on July 21, to protect players' interests and to preserve the integrity of beach volleyball. In 1984, the AVP Players go on strike. The AVP begins running its own tour. In 1985, the Bolle Sunglasses become a major AVP sponsor. The total tour prize money reaches $275,000. In 1986, AVP Pro Beach Volleyball receives cable television coverage and is shown for the first time in beach volleyball history on ABC's Wide World of Sports.